If you want to learn about kinesiology tape, buy kinesiology tape, watch kinesiology taping videos or keep up with the latest kinesiology taping news, be sure to check out the new, improved Theratape.com. For over a year, Theratape has steadily grown to become the online authority for all things related to kinesiology tape. Not content to rest on its laurels, a new, vastly improved Theratape.com was launched just last week. KT Tape (Kinesiology Therapeutic Tape) Precut Strips are now available and on sale. KT Tape is the only brand that offers rolls of pre-cut strips of kinesiology tape. Each 10″ strip can be easily torn from the roll, ready to apply. Each strip is also serrated down the middle, allowing it to be applied as a “Y” strip with no additional cutting. KT Tape Pro. Theratape also carries the new KT Tape Pro line. KT Tape Pro is a premium kinesiology tape with an advanced adhesive that is 25% stronger than most other kinesiology tapes. KT Tape Pro is available in single uncut rolls and bulk uncut rolls, and is extremely well-priced, with 20% more tape than competitive brands. The Theratape Education Center is a companion site to Theratape.com, and can be accessed directly from the top navigation bar. The Education Center contains the internet’s largest collection of kinesiology taping information, and is growing daily. Here you can download over 90 different printable application instructions for a wide variety of injuries or for athletic performance enhancement. If you prefer to watch, you can view the same number of videos, featuring professionals showing how to apply kinesiology tape. You can also access testimonials, news posts and detailed product specifications and information in the Theratape Education Center. Kinesio Tape – the brand that ignited the kinesiology taping explosion at the Beijing Olympics. 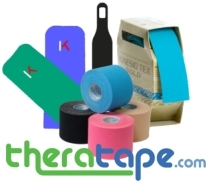 Kinesio Tex Tape is available in single rolls (2″ x 16.4′) and bulk rolls (2″ x 105′). RockTape – a premium kinesiology tape designed to enhance athletic performance. RockTape is available in 16 different colors and patterns (including camo, cow and biohazard), and comes in single rolls (2″ x 16.4′) and bulk rolls (2″ x 105′). SpiderTech Tape – the only company that offers precut kinesiology tape for specific parts of the body. SpiderTech’s pre-cut kinesiology tape comes in individually packaged applications for the ankle/foot/shin, calf/achilles, knee, groin, hamstring, hip, lower back, upper back, neck, shoulder, elbow and wrist. There are also 3 sizes of lymphatic applications designed to reduce severe swelling, edema and lymphodema. SpiderTech recently introduced SpiderTech Gentle, with a special gel-like adhesive developed especially for sensitive or fragile skin. This is only the tip of the iceberg for what you can find at Theratape.com. Check it out yourself – we know you’ll be impressed!